We run across this time and time again in aviation risk management programs: safety management teams confuse hazards and risks, and consequently also confuses risks and consequences. To be frank, misunderstanding the difference between these three things can have far reaching repercussions in your ability to practice risk management in your aviation safety management system (SMS). Confuses a risk with a consequence of the risk. Potential for risk management will be significantly stunted. Hazard management activities are only as useful as your ability to understand the relevant relationships between hazards and the specific dangers they pose to your organization. In other words, if you know the hazards, but don’t correctly know the risky situations that arise from them, then you will be misguided in what you ward against (i.e. misplaced risk controls). For risk management to be successful in safety management systems, safety management teams need to understand the clear distinctions between these three things. Having clear distinctions will render risk management programs organized with clear boundaries for how to assess different aspects of safety events – in short, good safety management. What Is a Hazard in Risk Management? A hazard is a thing (or lack of it), such a physical object, environmental variable, or a state of being that causes or leads to problems. And it’s very important to note that all hazards are a static thing and NOT a specific situation that requires immediate reaction. Another way to distinguish a hazard is that it is something has the potential to be dangerous depending on one’s interaction with it, but in and of itself it not dangerous. 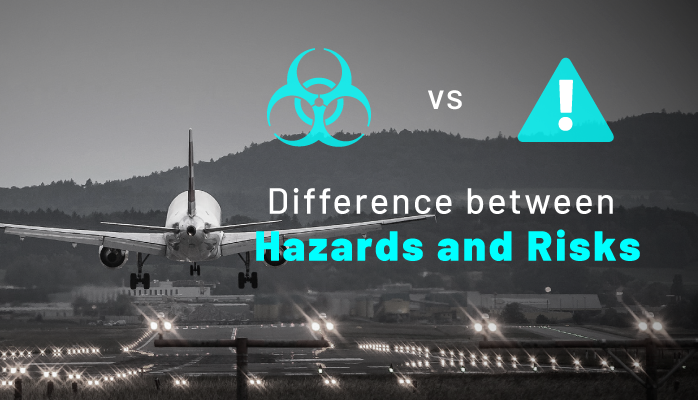 Keeping this is mind will help distinguish what the difference is between hazards and risks in aviation SMS implementations. Stresses (such as divorce): a state of being which can lead to distraction, self-destructive behaviors, etc. Employee Turnover: new employees are a hazard becomes they have a potential for things like incorrect use of machinery or software, being unaware of impending problems, etc. There are hundreds of potential hazards, but the one thing they all have in common is that they lead to problems, but in and of themselves are harmless. requires immediate reaction (which a risk control) or else face consequences. They are much different from hazards in that risk are inherently – well – risky. Without direct intervention, risk are dangerous and will lead to any number of consequences. This is an important point because often people will confuse a risk and a consequence. Runway incursion (resulting from lack of communication) is a risk that can have severe consciences if pilots don’t take immediate action (such as aborted landing/takeoff). What Is a Consequence in Risk Management? A consequence of Bird Near Aircraft could be damage to hull, damage to or loss of engine(s), damage to windshield, etc. A consequence of runway incursion could be damage to vehicle/aircraft, loss of life, company’s reputation, and so on. Remember, the important thing to note about these examples is that they clearly show different ways that damage is done. Consequences necessarily involve damages that can no longer be avoided. As said, this is different from risks, in which damage can be avoided. Hazard: a thing that is harmless by itself, but can lead to safety events depending on one’s interaction with it. Risk: a situation in which safety is lost and which requires immediate reaction to avoid or mitigate potential consequences. If you don’t immediately react to it, is there a good possibility that you will face serious consequences? If yes, most likely it’s a risk; if no, most likely it’s a hazard. Can someone’s actions affect the outcome of this situation? If yes, most likely it’s a risk; if no, most likely it’s a consequence. Is this (1) a thing/state of being, a (2) situation requiring immediate reaction, or (3) some hind of harm? One is a hazard, two is a risk, and three is a consequence. One of the toughest tasks in aviation safety risk management is the initial setup of the hazard register. The reason this becomes such a burden is because safety managers attempt to manage this task without the support of operational department heads. Safety mangers may be successful in solely managing the hazard register during the first four to six years of the SMS implementation. However, as the SMS matures, and as SMS inspectors become more discriminating due to your "mature SMS implementation," audit findings regularly occur because the hazard register is not properly managed. From the beginning of the SMS implementation, safety managers should be setting the expectation that the responsibility of managing the hazard register belongs to the operational department heads. Safety managers can provide training and guidance, but the department heads should be doing the work. Otherwise, your SMS implementation will never mature and deliver the expected financial benefits. Inadequate training on provided hazard register tools. If your company does not have a good hazard register, the following list will jump start your list of hazards. If you are an SMS Pro user, don't worry about this list, as it is integrated into the SMS database's "Proactive Hazard Analysis Tool (PHAT)." Managing a hazard register in a spreadsheet is not a best practice. A best practice is to have your list of hazards integrated into your risk management system that you use to classify reported safety issues and audit findings. Does your SMS need a low-cost, commercially available SMS database? 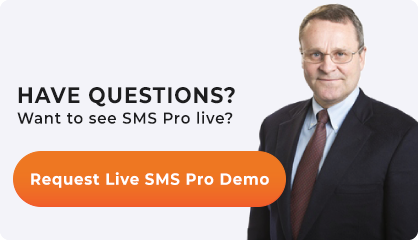 Learn how SMS Pro can help your company achieve its SMS goals and objectives. Below are some short demo videos you may find useful.